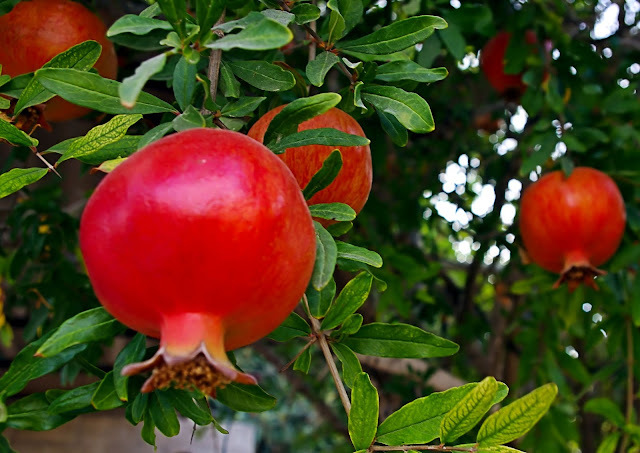 A letter from Israel: What is the connection between pomegranates and the Jewish New Year? Another year and another Jewish New Year, or rather Rosh haShana (the head of the year). And again we see pomegranates ALL over the place! I mean like...EveryWhere! There are pomegranates, real and decorative ones, on the table during the Rosh haShana meals. As a matter of fact, pomegranate seeds are one of food stuffs that have a special blessing. The are even pomegranates growing like crazy all over Israel. They are practically 'dripping' from their trees. So what is the story with all these pomegranates all over the place? 1. Jews eat pomegranates during Rosh haShana to a sign that people's good deeds should be as plentiful as the seeds of a pomegranate. There are 613 good deeds that Jews should do and legend has it that this is the exact number of pomegranate seeds found in a pomegranate. Trees are filled with pomegranates during Rosh Hashana in Israel. 2. 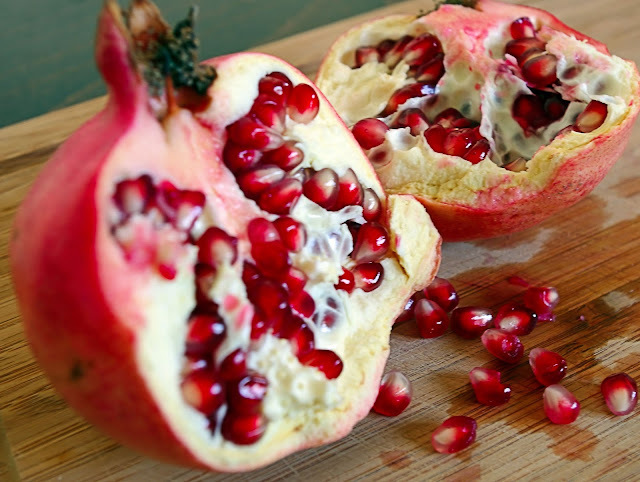 Pomegranates are now in season in Israel. And it is pretty obvious that the fruit that are in season will be in the supermarkets and growing in the trees and will be eaten with relish and all that. But let's put point 1 and point 2 together and think a bit about it.... The pomegranates are in season in Israel at the exact time period when Rosh haShana is celebrated and the Jewish people has a special prayer for them. There are many such connections between Judaism and the land of Israel, but I particularly like this one. Maybe it is because the pomegranate seeds are so beautiful and jewel-like or because they grow so plentiful on their trees. But it is probably because they are sweet and healthy and and a beautiful symbol for the hope of a wonderful Rosh haShana.